Tired of the same old NPR podcast? Well, Jennifer Ackerman-Haywood has the solution. 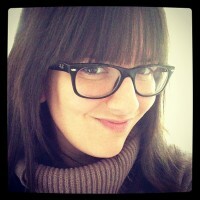 Jennifer is the host of CraftSanity, a crafty-based podcast available for download on her Web site or through iTunes. Each week Jennifer interviews a member of the craft community, whether it be someone just starting out or a super star. Her blog provides special projects and photos with links to featured guests. If you haven’t listened to it yet, I highly recommend subscribing to it. It’s always great to hear how DIY-ers got their start, where they find inspiration, how they run a business, etc. A must-listen. I actually had a chance to chat with Jennifer last weekend about the craft fair and what Handmade Detroit hopes to offer not only Detroit but Michigan as a whole. Jennifer mentioned the fair on this week’s podcast and will have some inteview bits with me soon. I’m really excited Jennifer is a fan of the fair and offering her support. Make sure to look for her on Aug. 5, as she’ll be checking out the DUCF for a first-hand report, and back to this blog for future updates and info about CraftSanity. Hi, I just wanted to say hi, I’m a crafty blogger from the Detroit area, and had NO idea until yesterday that there was an indie craft movement here. I’m rather excited about that. We have been thinking of moving away, but now the chances are pretty good that we’ll be staying…so HELLO. Hi! I took a look at your blog and your posts are AMAZING! If you’re in the area, you should meet up with us!